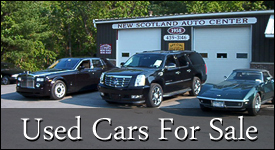 From the Owner - Joe Kaiser Jr.
"For as long as I can remember, I have always wanted to run my own garage and sell used cars. I feel that people need an honest, trustworthy auto repair shop. A place where customers don't have to worry about paying for services they don't need. I grew up in Connecticut working on cars at my father's business, Kaiser's Truck Shop. I started out pushing a broom and cleaning parts when I was very young. I watched and learned from my father as he ran a successful and respected garage in our community. I worked there throughout school. After graduating I attended Hudson Valley Community College for 2 years. While in school, I worked as an Auto Technician at Saturn of Albany. On school breaks and during summers, I worked as an intern at Robert Buick Pontiac in Danbury, CT. After graduating from HVCC, I took a full time position at the Buick Pontiac store as an Auto Technician. After seven years, I returned to the Capital District. This time with my wife, who is from Albany, and our 3 year old son. During my years at the car dealership, I took every available opportunity to attend training classes. As a result I have accumulated various certifications including Master Technician status from the Automobile Service Excellence Organization (ASE). I continue training through part supplier / manufacturer sponsored classes as often as possible. 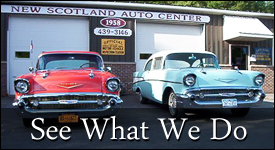 Because of the superior quality of their parts and nationwide warranties, New Scotland Auto Center recently became an AC Delco repair shop. In order to keep up to date and current with the ever changing world of Auto Repair Technology, I will continue to attend AC Delco sponsored training classes so that my customers will receive only the best quality and service possible."